elcome to the new and vastly improved football uniform site. If this is your first visit (and even if its not), this site displays graphical renditions of football uniforms. 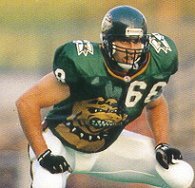 As creators of this site, Kevin Beller and Paul Reeths specialize in rare uniforms from several of the smaller leagues. We first started working on these uniform graphics for the United States Football League site and quickly found ourselves with requests to do several others. We started this site to show our work. We intend to eventually complete all the leagues listed on the left as well as add uniforms for defunct teams from the National Football League and any new leagues that may spring up in the meantime. We need your help. As you'll be able to tell once you look around the site, some of these uniforms are very complex. We're looking for photos that show unis from these teams so we can complete the graphics. 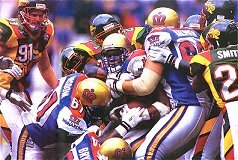 Topping our most wanted list are pictures of any of the 1995 WLAF teams (multicolored unis), defunct Arena League teams, the CFL's Ottawa Rough Riders and any good color shots from the American Football League. The best photos show coloring, sleeve, pant and sock striping and a nice shot of the helmet. Please email us if you have something to contribute. Check back here often to see the newest additions. We'll list them in the box to the right. Thanks to Channing Smith, Chris Bousquet, Marcel Kurpiers, Gene Crowley, Jim Cusano, Brandon Manzione, Pete Muego, Tim Capper, Dave Crilly, David Marli, John Meyer, Fred Nordloh, Gary Thompson and Lew Halboth for supplying pictures and graphics that helped us on many of the uniform designs.